The Astoria Armory has undergone extensive changes since its beginnings and will now be a place for the community to gather. USO shows and recreation for the troops got the Astoria Armory its start, but that purpose is being reinvented. Tough women clash in roller doll bouts, kids host birthday parties, orchestras fill the large building with music and now it will be the location for Mayor’s Balls. Saturday evening the Armory hosts the first Mayor’s Ball as a send-off to Mayor Willis Van Dusen. In 1920’s Gatsby style, the event will focus on movement, not a sit-down dinner, with a seven-piece band and other surprise entertainment. The black-tie-optional affair will provide much needed funds to gussy up the Armory and improve community options there. In 2013, Sam Johnson, the executive director of the Columbia River Maritime Museum, got Robert “Jake” Jacob and Robert Stang together to buy the building. From there, they formed the Friends of the Astoria Armory Board. In addition to Jacob and Stang, board members include Sean Fizpatrick, Greg Peterson, Bruce Jones and Jennifer Rasmussen. The only employee of the Armory is Events Coordinator and Community Director Robyn Koustik. Koustik is also a team member and spokeswoman for the Roller Dolls. The reopened armory has given the team a new place to practice and host bouts. The Roller Dolls weren’t the first to use this space for entertainment, however. Since the building’s creation in the ’40s, it has been used for speeches, concerts and plays. During his vice presidency, Richard Nixon spoke at the Armory. The Camel Caravan played in the Armory’s early days. 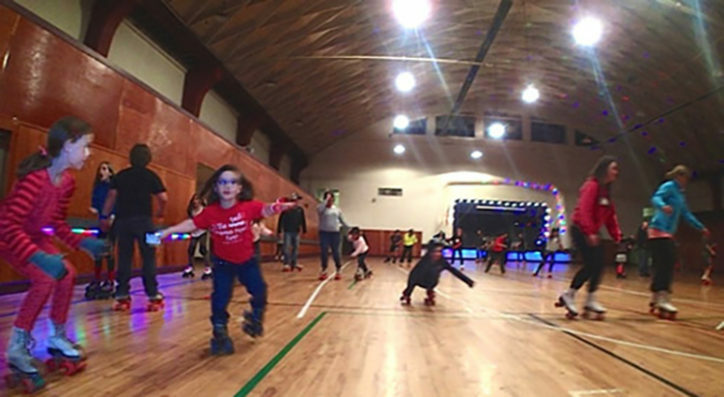 In the ’90s, the Clatsop Christian Center started the project going now, with worship services and roller skating. It sold the building in 2002. Most recently, the Armory hosted the Columbia River Symphony. The construction of the ceiling wass built to broadcast sound throughout the building, but the sound of pigeons was all that it had echoed after 2002. Koustik and Fitzpatrick got the keys to the Armory at 6 p.m. June 6. By the next morning, they had cleaned enough to let skaters in the building. Almost 30 volunteers were there that morning to get started on the multiple projects ahead. From a boat in the concession stand to trash littering the main floor to pigeon droppings ingrained in the carpet threads, the building’s upstairs had been left in a rough state and only the basement was in use as storage for the Maritime Museum. So far, the team has brought down walls, repainted, opened a stairwell, built a concession stand and a skate rental nook, brought the building up to fire code and isn’t stopping there. More than 10 big items are still on the list to get the building where the board ultimately wants it, including improvements on plumbing and electric systems, more painting jobs and eventually upgrades of the stage and side rooms. None of the projects could have been done without discounts on labor and materials or the hours of helping hands. Though it has not been “sold” quite yet, the Armory is on lease for a year for $1. By next June, $250,000 will buy the Armory. Similar generosity has helped get the Armory on its feet. “Literally within the first month we had 1,000-plus hours of volunteer time,” Fitzpatrick said. Volunteers have put in the time to help clean, staff events, be “skate guards” and any other project they can get their hands on. Koustik said many members of the community, young and old, come in with extra time on their hands looking to do anything and everything. Koustik said most often younger participants are preteens looking to contribute to the community. Ultimately Koustik said she would like to see the space become a community center of sorts. “We’re providing a safe, healthy place for people to come,” she said. Children’s literature readings, resumé-building programs, exercise classes and study rooms are all on the table. According to Jacobs, that use would just be bringing the building back to its roots. “When we were kids, this is where everything happened,” he said. Skate nights are regularly from 5 to 9 p.m. Fridays, though no skate night will be held tonight. Other events are listed on the Astoria Armory website and tickets for Shanghaied Roller Doll events and the Mayor’s Ball can be purchased at brownpapertickets.com. Proceeds from ticket sales for the ball go directly back into the Armory.